Update: The concert was a tremendous success! Thanks to all who participated, supporting the good efforts of Seeds For Tomorrow! You are Invited to the 2009 Spring Concert of Hope! A BENEFIT CONCERT BEING HELD FOR AMERICAN AND IRAQI CHILDREN WHOSE LIVES HAVE BEEN IMPACTED BY THE IRAQI WAR. JOIN US FOR A COMMUNITY CELEBRATION OF MUSIC, HEALING AND HOPE. The 2008 Spring Concert of Hope in Pipersville PA was a night of incredibly heartwarming sharing and fun for the hundreds of caring individuals who attended. 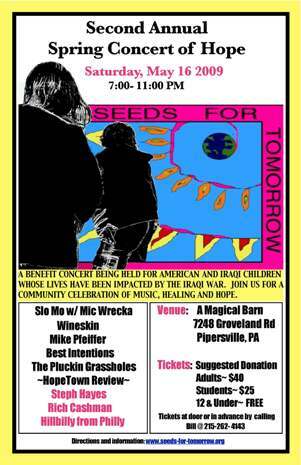 Seeds for Tomorrow, a nonprofit 501(c)3 organization, hosted the concert. (www.seeds-for-tomorrow.org). The concert was held in a wonderful large old barn in scenic Pipersville, PA. With fabulous music, free food and dancing, the concert raised over ten thousand dollars to support Iraqi and American children who have lost parents in the war. Some of the funds sent American children who have lost parents in the war to a camp to help children overcome trauma hosted by Tragedy Assistance Program for Survivors (TAPS) (http://www.taps.org), a nonprofit organization that has helped thousands of children deal with and overcome grief. Some of the funds were used to support the building of schools in Iraq, in conjunction with War Child International, (www.warchild.org), a non-profit organization that works directly in Iraq. Join us on May 16, 2009 for an incredible evening of music, caring, food, silent auction and friends from various countries, all working together to bring healing and hope to the eyes of the children. Learn about the endeavors of Seeds For Tomorrow, a group of caring business people from the Doylestown PA area who have teamed with other nonprofits such as those mentioned above, and other outstanding organizations such as Conscience International (www.conscienceinternational.org) to Make a Difference. Join Us, have a wonderful evening of music, food and friends. Come, Enjoy & Make a Difference for children!